Get notified when San Jose Sharks tickets are available! The San Jose Sharks are a National Hockey League team that plays in the Pacific Division of the league’s Western Conference. Founded as an expansion team in 1991, the team won their first division title in 2001. 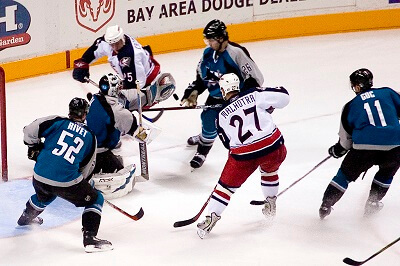 The San Jose Sharks play home games at the SAP Center, which is located in San Jose. Fans refer to the stadium as the Shark Tank, and it opened its doors in 1993 as the San Jose Arena. The arena is large enough to seat more than 17,000 for hockey games, and you can be one of the fans in the stands by using the links above to purchase San Jose Sharks tickets online.